Silencing Conservative Voices By Using Shadowban Technology. We allege Twitter CEO John Dorsey is censoring conservative and Donald J Trump supporters using Shadowban and Stealthban Technology. Signed in Twitter members can see their tweets. But to the public tweets are lost in cyberspace censoring Trump supporters. It’s down right sneaky. And the way it’s being done could be against SEC security trading regulations! This video shows how to quickly check if your account is stealth banned. Searching for our tweet without being signed in yields nothing. But after signing in out tweet is clearly visible. We’ve posted a bunch of pro Donald Trump articles, forum posts, and media images, etc. Then then shared our meta to Facebook, Twitter, and Google+. After tweeting a blog post WordPress was hit by a bevy of bots coming from Twitter. But for quite a long time not a single bot visit came from Twitter. Yesterday we found out we were being censored by shadow-banning. According to this post by Breitbart news. Shadowban is a common practice used by Twitter to censor pro Donald Trump supporters. And others Twitter don’t approve of. According to the source, Twitter maintains a ‘whitelist’ of favored Twitter accounts and a ‘blacklist’ of un-favored accounts. Accounts on the white-list are prioritized in search results, even if they’re not the most popular among users. Meanwhile, accounts on the blacklist have their posts hidden from both search results and other users’ timelines. For site owners, the ideal shadowban is when a user never realizes he’s been shadowbanned. However, Twitter isn’t merely targeting spammers. For weeks, users have been reporting that tweets from populist conservatives, members of the alternative right, cultural libertarians, and other anti-PC dissidents have disappeared from their timelines. Doc’s Twitter account is verified by email and cellphone text code. We do not post fake news. Or spam of any kind. We are however a strong supporter of Potus 45. For better than a year when logging in to our account. We were sent an email alerting us of our login. We were also told to change our password. Our password was changed several times. But account login notification emails kept coming. Tweets to Twitter @Support also went unanswered. We finally created a Gmail filter to archive these notifications. 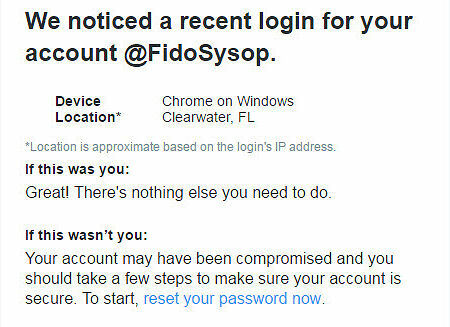 It was a PITA getting one each time we logged into our Twitter account. This also explains the lack of bots accessing the article after it was tweeted. Update 03/27/17: Our Twitter login notifications keep coming. We removed our Gmail filter that auto archived these login notification emails. But after logging in this morning.. BAM!